"Gunna be good to put on that burnt orange again," Sam Saxton tweeted Thursday. AUSTIN, Texas — The Saxton Longhorn legacy all began with James Everett Saxton, Jr., who became an All-American running back for Darrell K. Royal and finished as Heisman Trophy finalist in 1961. The elder Saxton was later inducted into College Football's Hall-of-Fame. Saxton's son, Jimmy, was a star quarterback for Westlake High School and followed his dad's footsteps. Former Texas head football coach David McWilliams signed Saxton, and he finished his career as a Longhorn defensive back. 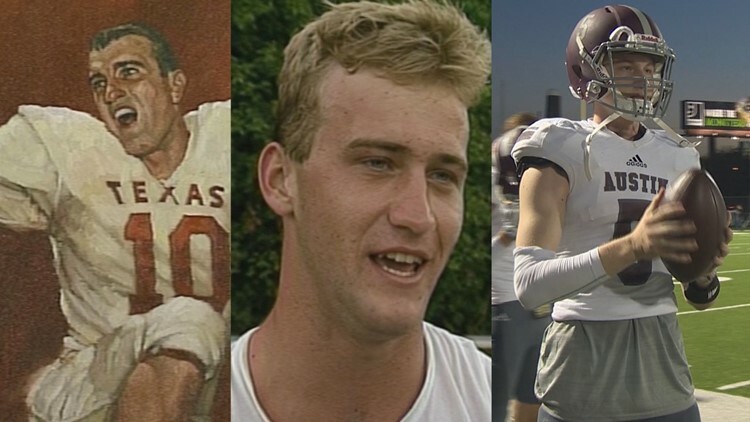 Jimmy's son, Sam, began his high school career as a Westlake quarterback and actually played during his sophomore season -- Sam Ehlinger's senior season -- at Westlake. The youngest Saxton transferred to Austin High School for his junior season and completed his high school career at St. Michael's Academy. Sam received multiple football scholarship offers including Stephen F. Austin and Sam Houston and was committed to Southern Miss at one point. But, Tom Herman and Longhorns extended an offer as a preferred walk-on. An offer Sam accepted this week.